I love your player aids and the new site looks fantastic! Can’t wait to see the updates as they come. 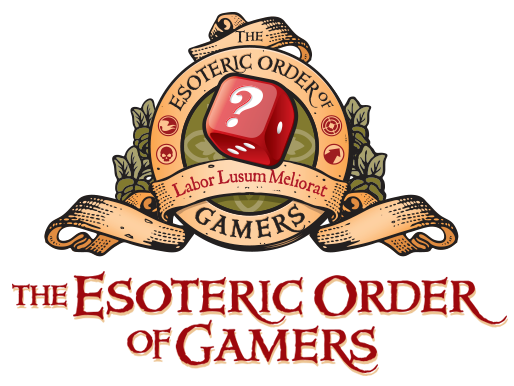 In your EOG logo above, are you sure about the use of “lusum” rather than “ludendum”? Not at all! But a Latin teacher corrected my original attempt of ‘Operibus duris ludo amplio’ to ‘Labor Lusum Meliorat’ and I assumed he was correct. I’d be most interested if you can prove otherwise Chris, as of course I’d like the motto to be absolutely correct. I don’t know if I can prove it, since I can’t be certain of what you’d intended it to say; but if my interpretation of what you’d intended it to say is correct, then the gerund “ludendum” would make more sense than either the perfect passive participle “lusum” or the supine “lusum”. Alternatively, “ludum”, the accusative form of “ludus”, would be another possibility that would make more sense than “lusum”. Sorry, the phrase is supposed to be ‘Toil Makes Play Better’ basically. So what would be correct? On an unrelated matter, I have a question about something on your tekumel.com site. Should I ask it here? Or is your preference that questions be asked there through its forum? I had a look in the Oxford Latin Dictionary, and there is a noun “lusus” (which has the accusative form “lusum”); its first listed meaning is “the action of playing, sport; (specifically) gambling”. For comparison, it gives “play, sport; a particular sport, amusement” as the first listed meaning of “lusio” (accusative “lusionem”). Argh! 🙂 So for someone who knows nothing about Latin, I’m still not sure where to go – to be honest, ‘effort improves the game’ is closer to what I was after than ‘hard work makes sport better’! 🙂 The general idea is ‘Work makes play better’ I guess. Actually I’ve now forgotten the original English phrase I started with! Google translate is certainly worse than useless when it comes to Latin, obviously. Ask away. Headlesshollow.com has been lying fallow for a while, but here’s as good a place as any to ask me a question. “Labor ludum meliorat” would be fine for “Effort improves the game”. Latin “labor” can be translated as “labor”, “toil”, “exertion”, “effort”, “work”, &c., but if you have a particular sense of “work” in mind for “Work makes play better”, there might be a more specific Latin word for that sense. My tekumel.com question is regarding the Letter from Mirusíya shown at http://tekumel.com/pic_letter.html — is there a larger version of the illustration available? I’d like to be able to decipher the name of the “worthless scribe” at the end of the Letter. I have a version about double the size – email on ‘head’ before the name of this blog.